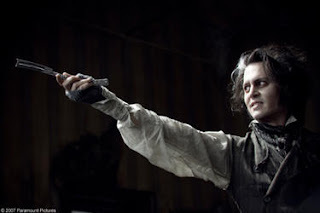 I hesitate to say a word against Sweeney Todd, and mostly I found it remarkably creative, well- crafted, and well-acted. Johnny Depp is in my highest pantheon (with Susan Sarandon, Jessica Lange, Tim Norton, and a few others) of actors who I admire most. Sweeney Todd is a Tim Burton joint, of course, and in case you don't know about their collaboration (Charlie and Chocolate Factory, Edward Scissorhands, Ed Wood, and a few others) there's a mini-trailer preceding the film (so odd) which tells you all about why they are so brilliant together; it's all "we have one mind; we are family" folderal. Fine fluff, but should have stayed a DVD extra. Anyway, my small complaint is that Helen Bonham Carter can't sing. Having seen Patti Lupone twice perform the role of Mrs. Lovett, and heard recordings of Angela Lansbury singing the same, any Sondheim queen would have high standards. What she did, though, was enunciate, and I appreciated that, and she acted with unique and tender subtlety (she's Merchant/Ivory trained, after all) towards the ward, Toby (played by a brilliant child actor Ed Sanders, whose perfect singing really made Bonham's sound wispy). But she was miscast, and that's that. And more generally, and my Sondheim friends have threatened to disown me if I put this in print, albeit digital, I just don't think Sweeney is his best work. I think it's really high camp ("at last my arm is complete again!" Ugh. Embarrassing. Why couldn't he have just said "At last I am complete again," which is really the point), and the very best songs (Pretty Women, Joanna, Nothing's Going to Harm You) actually sound like they were originally written for Company or Into the Woods, in my opinion. Yes, I know Into the Woods came later, but my point is still that musically they sound different to me, lighter and of a different era. But there's no denying the genius of A Little Priest. I swear you can listen to that song 100 times and hear new lyrics every time. It is as funny, intricate, insightful as anything Shakespeare ever wrote. But Sweeney is just a major downer. It's an operatic tragedy, but it's hopeless at the end, and so for me there's no genuine catharsis. Apologies to Sondheim fans everywhere, but that's how I feel. 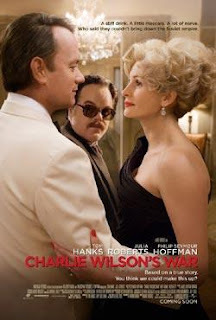 I liked Charlie Wilson's war. It's like a good episode of West Wing. You learn a lot about the covert war against the USSR we fought through Afghanistan in the 1980's. Julia Roberts is fantastic, but I had a problem with the glibness of her monologues. It was not believable to me that a Houston socialite could be quite so articulate. Aaron Sorkin writes speeches, not dialogue, more often than not. Oh I guess Philip Seymour Hoffman was okay. 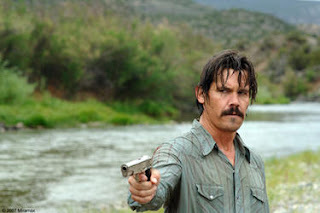 I'm not going to crap on his performance, like I did in an earlier post about The Savages, but I will say that once again he's playing a snarly misanthrope, and he looks even grosser than usual. I'm sorry, but I'm not on the PSH train. I almost didn't see the movie, because it had Tom Hanks, who I find repulsive most of the time for his smug all-American do-goody persona, but don't let it stop you this time. He's trying to play against type, kinda sorta. I mean he's still the hero; Hanks always has to be the hero. 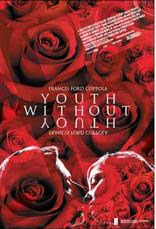 Youth Without Youth is the most challenging movie I've seen in a long time. It's Coppola's new movie, his first in 10 years. The plot is impossible to describe, but watching I thought: "if T. S. Elliot wrote a screenplay, this would be it." It's full of polemics--political, academic, psychological, metaphysical. It's absolutely gorgeous to look at--all Coppola movies are, because he works with only the very best, most legendary cinematographers. The movie spans several decades, and he tries to imitate the filmmaking style of the decade, so there's a little noir, a little agitprop (the 4o's) , a little Bergmanesque existentialism (the 60's). This movie will make you think, but probably not make you feel. Who it's for: cinephiles, Coppola fans, graduate students in theology or philosophy.